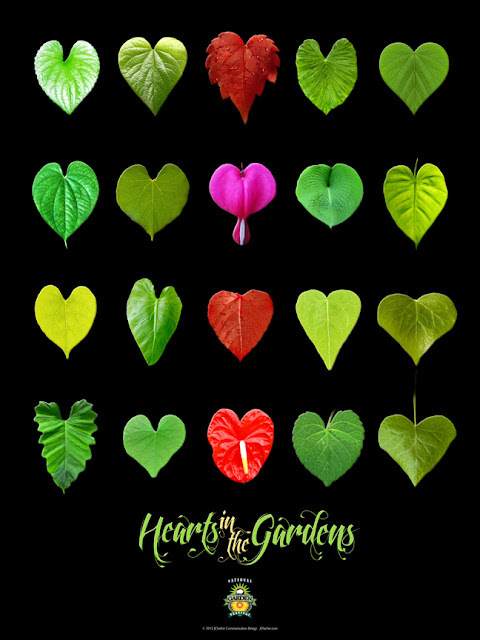 Hearts in the Gardens is a fundraising party for the National Garden Festival to be held on Tuesday February 14, from 6:00-9:00 p.m., at the Buffalo & Erie County Botanical Gardens. Tuesday is the RSVP deadline! Don't bring your sweetheart flowers, bring them TO the flowers for Valentine's Day! It'll be a romantic (and warm!) venue as you enjoy the popular NIGHT LIGHTS at the gardens, the Amaryllis & Cymbidiums display and the current Arcangel Gallery exhibition. Heavy hors d'oeuvres by Lucarelli's, beer, and wine will be served. Cost for the event is $50/person, $75/couple. If that's not enough, a limited edition poster I designed for the event (seen above), will be available for sale ($20) as a fundraiser. Only 50 are being printed. Purchase the Hearts in the Gardens poster and I'll sign and date it -- on Valentine's Day! Can you name all the leaves on it? In addition, there will be a silent auction which, so far, includes dinner certificates, hotel overnights, an Urban Roots wheelbarrow of garden goodies, and a garden consultation by Master Gardener Sally Cunningham. Many more items are coming in every day. You can find a full list here in my last post. Also that night we anticipate announcing the neighborhood that will receive the Front Yard Garden Contest "makeover" by the members of WNYS Nursery& Landscape Association members and the Buffalo Olmsted Parks Conservancy. And we'll also announce a new kickoff event to the Festival to take place in June that you will not want to miss (still waiting for city permits to be approved!). The party, chaired by Mary Ann Kresse, is to support the efforts of the Festival and in support of the nearly 1,000 gardeners that participate in the local garden tours, Open Gardens, and the NGF Front Yard Contest, gardening non-profits, garden center professionals, WNYS Landscape & Nursery Association members, National Garden Festival volunteers, landscape designers, master gardeners, and garden clubs – the real hearts in all our gardens! The third annual National Garden Festival is a six-week long garden party held, this year, from June 22-July 29. The Festival promotes all the WNY garden tours (14 of them! ), including Garden Walk Buffalo (the largest garden tour in the U.S.); it hosts Thursday and Friday Open Gardens throughout Buffalo Niagara; coordinates speakers, talks & workshops; organizes, with AAA/Horizon Club Tours, garden-themed bus tours every Friday; and makes over an entire block in a city neighborhood with the Front Yard Contest. Partners for the National Garden Festival include the Buffalo & Erie County Botanical Gardens, the Buffalo Olmsted Parks Conservancy, the WNYS Nursery & Landscape Association, Garden Walk Buffalo and Visit Buffalo Niagara. Other organizations involved include Buffalo in Bloom, Eighth District Federated Garden Clubs, WNY Hosta Society, WNY Daylily Society, Forest Lawn Cemetery & Arboretum, Grassroots Gardens of Buffalo and more. Your support is urgently needed to produce this third season of the National Garden Festival. It will take all of us, including you, to help grow Buffalo’s budding national reputation as a summer gardening destination. Great poster! We have our tickets for the event and are looking forward to a wonderful evening! Your post is wonderful, Jim. See you there. Sorry, it should have said poster. Blogger is giving me a hard time posting comments. We'll get to meet in person. I hope you won't be disappointed. I'm even less charming in person than I am online. I thought the post was wonderful too. We'll see you there, we'll have about 150+ by the time of the event attending. There are some GREAT raffle items too. Love the poster (I'm a foliage gal) - it's not only visually stunning but so inventive. Great job. Unfortunately, we cannot make it to Buffalo tonight! You MUST reproduce this wonderful poster after the event for those of us who were unable to attend!